The Charlie Appleby-trained YA HALA won the EBF Maiden Fillies' Stakes at Nottingham this afternoon, at the same time becoming the 125th winner of a Tattersalls October £25,000 Book 1 Bonus. The daughter of SHAMARDAL won a total of £38,063 for her owner Sultan Ali on debut, made up of £5,563 in prize money, £7,500 from the Plus10 Bonus and £25,000 from the Book 1 Bonus. 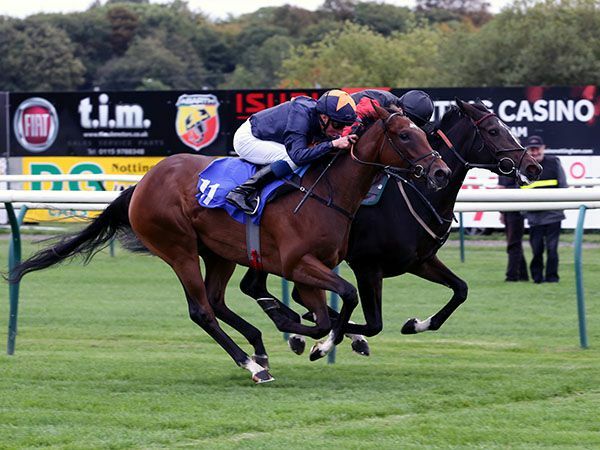 YA HALA is out of the Listed winning BARATHEA mare MOUNT ELBRUS and was offered at Book 1 of the October Yearling Sale by Houghton Bloodstock.